OBD Aftermarket size is set to exceed USD 1.5 billion by 2024; according to a new research report by Global Market Insights, Inc. The increasing emphasis on developing connected vehicle solutions and the growing adoption of IoT technology in the automobile sector are driving the growth of the OBD aftermarket. The increase in vehicle production, particularly LCVs and HCVs, has generated the demand for more stringent emission control standards. The government agencies around the world have implemented stringent emission control regulations to combat the increasing impact of air pollution on the environment. The increasing complexities in vehicles have generated the need to have more robust remote diagnostics solutions. Remote diagnostics technology is also gaining more popularity as it provides the vehicle owners and technicians with the real-time information about the vehicle’s status and helps in the effective monitoring of vehicle components remotely. The passenger vehicles segment held a dominant share of over 40% in 2017 in the global OBD aftermarket. The increased production of passenger vehicles, particularly in the U.S. and China, is majorly contributing to the adoption of OBD telematics solutions in the segment. According to the American Auto Council, the U.S. auto production is expected to exceed 12 million vehicles per year through 2019 and reach 13 million by 2020. As it has been made mandatory by government institutions in various countries to have OBD compatibility for passenger vehicles, the segment is projected to grow consistently during the forecast timeline. The hardware segment held a majority share of over 40% in the OBD aftermarket in 2017 due to the large-scale adoption of traditional OBD scanners such as scan tools and code readers to access the vehicle’s OBD port. These scanners act as an interface to provide users with the vehicles’ engine-related parameters. However, with the emergence of OBD dongles, additional information, such as driver behavior analytics and remote diagnostics, can be effectively extracted from vehicles. The OBD apps segment is expected to exhibit the fastest growth by 2024 at a CAGR of over 25%. The increasing penetration of smartphones and the adoption of advanced telematics technologies have triggered the demand for mobile-based apps. As the OBD apps reduce the dependency on any hardware to gather information and make it possible for the user to convert the smartphone or tablet into a portable OBD scanner for gathering diagnostic information, the demand for apps is likely to grow during the forecast timeline. These apps handle all the information collected from the OBD systems and ease the task of monitoring the vehicle parameters in the real-time, allowing the continuous monitoring of the vehicle’s status. The fleet management segment dominated the OBD aftermarket in 2017 with a market share of over 45% and is expected to maintain the dominance throughout the forecast period. The use of OBD in the fleet management software offers effective management of fleet operations and provides access to the real-time data regarding the vehicle’s location. It also monitors the driving patterns and helps in early diagnosis and mitigation of any malfunction in the vehicle components. With the significant growth in the electric vehicle technology, the demand for OBD telematics systems for managing and controlling the vehicle components is expected to increase significantly. The fleet management software in electric vehicles helps in increasing the fleet efficiency and reducing the operational costs. North America held a major share of the OBD aftermarket in 2017. The proliferation of OBD dongle-based solutions is estimated to grow at a faster pace in the region between 2018 and 2024. The automobile sector in this region continues to record a steady growth due to the high penetration of advanced technologies in the transportation systems and the increased momentum of autonomous vehicles. The presence of some major global automobile players and the increasing investments by foreign auto suppliers in their manufacturing facilities are driving the region’s automobile market growth. For instance, in January 2018, Ford planned to invest USD 11 billion in electric vehicles to have 40 hybrid and fully electric vehicles in its model lineup by 2020. Similarly, in April 2016, Nissan made strategic investments in its U.S. operations to meet the growing need of the U.S. consumers. The company has invested around USD 10.8 billion in its U.S. operations since 1981. 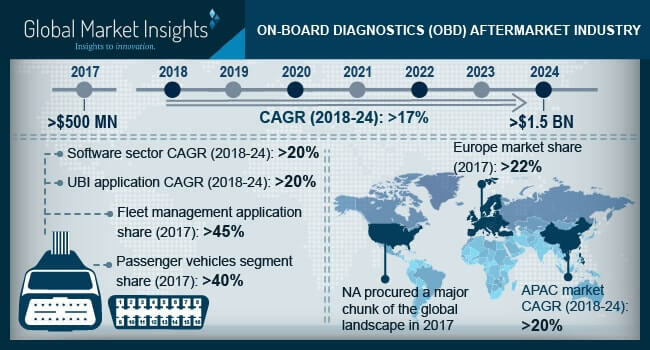 Companies operating in the On-board Diagnostics Aftermarket focus on offering new products along with strategic acquisitions to leverage their mutual technological capabilities and create innovative offerings. For instance, in April 2018, Quartix launched a new installation option; plug, and track. The new tracking device can be easily installed into the OBD port and it eases the installation and flexibility when moving the tracking function from one vehicle to another without disconnecting the hardwiring. In April 2017, SiriusXM acquired Automatic, the maker of the Automatic Pro and Automatic Lite connected car OBD II ports accessories for USD 10 million. The acquisition enabled the company to expand and improve its connected vehicles services. Some of the key players operating in the OBD aftermarket are Continental, Automatic Labs (SiriusXM), Magneti Marelli, Tom Tom, Geotab, Danlaw, CalAmp, Verizone, Mojio, Intel, Metromile, ERM Telematics, Azuga, Xirgo Technologies, AVL Ditest, Vector Informatik, Bosch Diagnostics, and Autel.